Roof opening fall through accidents pose a significant risk from the first day of construction to every day after the building is complete. It is extremely important to install skylights that protect people. Maxim Skylights has tested two unit skylight models and one roof system model to make sure we offer multiple options to protect workers or anyone who happens to be on the roof for whatever reason from falling through one of our skylights or roof systems. Maxim Skylights has not stood by waiting for our own industry to agree on a test protocol or even a product performance standard. An industry wide product performance standard is far overdue and it is one of the most unfortunate aspects as too many big companies in the skylight industry have failed the entire roofing industry. 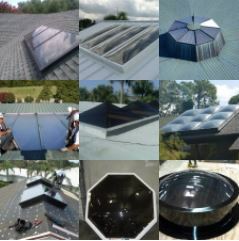 But Maxim Skylights, working closely with our product testing facilities, went beyond what any other companies have attempted and it is our position that “meeting” an unofficial test standard was not good enough. Maxim went to extreme measures to make sure when we put a label on our skylights indicating the unit meets “OSHA Fall Protection Guidelines” we would be 100% confident that we are providing unmatched protection. Please see our “Videos” page where we show what happens when a 200lb bag of sand and gravel is dropped from over 16’ onto our “Fall Protection” skylight models. The videos are after we completed various placements and multiple drops of the same 200lb bag from 12” to 72”. The 16’ drop was to show how seriously we take this issue. Until there is some industry standard or test protocol, Maxim Skylights believes it’s in the best interest of safety to provide the highest performing skylight available for the prevention of roof fall-through accidents. iOS users may need to download the PDF in order to edit the fillable fields. Only Impact Resistant Glazings are available. With options of polycarbonate domes and pyramid domes, 100% impact modified acrylic domes and pyramid domes, single polycarbonate dome over 16mm 5 Layer or 25mm 7 Layer cellular multi-wall polycarbonate panel, or impact resistant insulated glass with SentryGlas® are available to insure glazing options for every type project. 16mm and 25mm Multiwall in clear or white and Cardinal Glass LoE366 & LoE340 coated insulated glass with many other coatings and tints also available. Unlimited glazing configurations exist so please consult with your local distributor or Maxim Skylights directly for custom glazing options. Polycarbonate Double Pyramid Domes: 22˚, 30˚ or 40˚ with custom pitches available. 100% Impact Modified Acrylic Double Pyramid Domes: 22˚, 30˚ or 40˚ with custom pitches available. Single Polycarbonate Pyramid over a 5 Layer Cellular Multiwall Polycarbonate Panel: 22˚, 30˚ or 40˚ with custom pitches available. Multiwall Cellular Polycarbonate in thickness of 16mm (5 layer) or 25mm (3 layer & 7 layer). Dome and Pyramid colors of clear, standard translucent white, high light transmission translucent white, dark bronze, dark gray, and light gray are available in any combination. Insulated Glass is provided by Cardinal Glass. Unlimited tints and LoE Coated options are available. Please visit the Glazing Page for information on our suppliers and links to their websites where additional information can be found on all of our glazing options. Unlimited glazing configurations exist so please consult with your local distributor or Maxim Skylights directly for additional glazing options. Curb Mount Skylights for applications where flashed curbs are to be site built or are existing and our skylight will be sealed and anchored to the curb by the installer. Standard Curb Mount – our standard frame option. Thermal Break Curb Mount – Includes an additional urethane “break” in the frame to help provide additional thermal performance in colder climates. Self-Flashing Skylights include a prefabricated aluminum curb wall and are available in a single wall curb or an insulated double wall curb with 1.5” of polyisocyanurate insulation and a concealed 2X4 for anchoring that complies with our test specimens. Curb heights are available in standard and special heights for mounting directly to the roof deck. Common heights are 9”, 12”, 14” and 16” but Maxim is able to provide any height required to meet every project specification. Single Wall Self-Flashing comes fully assembled and is available with an optional exposed 2X4 wood nailer to provide a solid termination point for the roof membrane or termination bar but also provides proper fastener anchoring per our product testing. The curb(s) are able to be shipped separately (loose) for installation prior to the skylight portion. Installing the curbs prior to the curb mount portion provides protection of the finished skylight and glazing during the roofing installation process and minimizes jobsite damage to the finished skylight. An optional addition of 1.5” polyisocyanurate insulation can be added and is adhered to the exterior wall but is left exposed to be covered by the roof membrane at time of installation. Insulated Self-Flashing with (Maxim(um) Insulated Curb is a 1.75” thick curb wall with a concealed 2X4 and 1.5” polyisocyanurate insulation between aluminum inner and outer walls. This option allows for the skylight to be shipped fully assembled or with the curb(s) shipped separately (loose) for installation prior to the skylight portion. Installing the curbs prior to the curb mount portion provides protection of the finished skylight and glazing during the roofing installation process and minimizes jobsite damage to the finished skylight. Maxim offers stainless steel fasteners and sealants upon request to make this a simple process. Thermal Break & Insulated Self-Flashing with (Maxim(um) Insulated Curb is a 1.75” thick curb wall with a concealed 2X4 and 1.5” polyisocyanurate insulation between aluminum inner and outer walls. The skylight frame has added condensation resistance in the form of a urethane “break” in the extruded frame and is suggested in colder climates. The Maxim(um) curb option allows for the skylight to be shipped fully assembled or with the curb(s) to be shipped separately (loose) for installation prior to the skylight portion. Installing the curbs prior to the curb mount portion provides protection of the finished skylight and glazing during the roofing installation process and minimizes jobsite damage to the finished skylight. Maxim offers stainless steel fasteners and sealants upon request to make this a simple process. Prevention of roof fall through accidents is paramount and is the reason Maxim Skylights does not, will not, offer a non-impact resistant domed, formed or glazed skylight. It has been our opinion since Day One that non-impact performing thermoplastics or glass, specifically general purpose acrylic, are an unsafe option for any roof opening. Period. The ambiguity of the OSHA roof opening and roof covering standards have left interpretation up to the skylight manufacturers and testing facilities but without guidance or agreement there currently is no official test protocol. Clearly placing a 200lb bag on any given skylight glazing that “results in no breakage” is not a realistic real world environment scenario. Maxim Skylights believes dropping the 200lb drop test is the absolute minimum that should be followed. Weatherability: Since thermoplastics are subject to breaking down due to normal weathering and UV exposure, Maxim Skylights provides only double glazed products. With our double domes or dome over polycarbonate multiwall glazing options we have addressed the weathering concern. The outer UV enhanced dome prevents UV light transmission and therefore prevents weathering of the inner glazing either dome or multiwall. We feel 100% confident that the inner glazing will maintain original impact resistance and certainly will exceed the dangerous single glazed configuration. Increased Height of Drop Test: While a 200lb drop test is commendable, Maxim Skylights performed the drop test repeatedly on the same specimen from 24”, 36” 48”, 72”, and finally at 192” (16’). After multiple drops of the 200lb bag of sand and gravel, the impacts resulted in no damage to the frame or delamination of the glazing. Test reports tell a nice written story, but we have posted the video of the actual tests from 192” so it is clear how well our skylights perform. The option of a cage or screen has also been a popular method to claim fall protection compliance. The fact is an additional exterior cage or screen does not always provide the intended protection and there are many other reasons why one should just use a skylight with double glazed impact resistant material. Steel. Steel must be finished or protected in some way so as to prevent rust and weathering from rendering the cage/screen ineffective. Unsightly Finishes. Many are hot dipped galvanized which is not only unsightly but will not provide long term protection against rust and weathering and therefore limit their level of protection. In addition, galvanizing will deteriorate quickly leaving a rusty cage over each skylight. Site finishing is unrealistic since it would lead to additional site labor costs and a high likelihood of damage to the skylight glazing. Dissimilar Metal. Attaching a steel cage to an aluminum skylight will require a separation between the two to prevent a dissimilar metal reaction. Additional Costs. Adding an additional item in the form of a cage or screen will add additional costs to the project in the form of manufacturing costs, shipping, site handling, site storage, and additional installation labor. Why choose the least expensive skylight with non-impact resistant glazing (general purpose acrylic) and the additional cage when the option is available in the form of our skylights? Until there is some industry standard or test protocol, Maxim Skylights believes it’s in the best interest of safety to prevent roof fall-through accidents with the highest performing skylight available. Please visit the Download Center to see all of our editable .pdf drawings that make choosing the right skylight easy.